Just like your car occasionally needs to be turned over to your local mechanic to have something fixed, so can your automatic garage door require some professional repairs. The good news is that you won't have to go anywhere. Our technicians will come to you. We'll troubleshoot the problem until we discover its root cause and then apply the right solution for it. After helping so many local homeowners with various issues for so long, we're fully confident that there's no problem we can't tackle. One of the most common reasons we're called to assist a customer with a problem is because a spring broke. These components are the ones that allow the panels to move up and down, and without them, opening the door will become impossible. They can be very dangerous, because they are under a lot of tension and they can seriously hurt someone if they are mishandled. Let our experts take care of any spring replacement work that you need and we'll make sure that the task gets done without compromising anyone's safety. If you suddenly discover that your door won't open even though the springs are perfectly fine, or that it refuses to close and keeps reversing, there's probably something wrong with the opener. This device can experience both mechanical and electrical issues, including a broken gear, a fried circuit board or even misalignment of the safety sensors. No matter which part is responsible for the malfunction, our technicians will be able to repair the damage or replace the affected parts with new ones. Our team can help you whether you require emergency repairs or want to have an old opener replaced with a new and improved model. 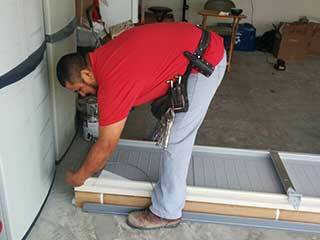 Contact Garage Door Repair Sandy today and let us handle whatever you need.